Detailed Description: Schneider Electric / Square D e-stop Right cable mount rope pull switch uses two NO and two NC contact illuminated, booted push button for convenient ON/OFF operation. It has Zamak constructed body and corrosion resistant stainless steel made cover for durability. It is used to trigger up to 165 ft long cable and can be tripped at any point in work zone. Switch is rated for maximum insulation voltage of 500 Volts, maximum impulse withstand voltage of 6 kilo-Volts and thermal current of 10 Amps. It has vibration resistance of 50 gn and shock resistance of 50 gn for a duration of 11 milli-seconds. Switch has resistance of 25 milli-Ohms between terminals for offering better conductivity. Switch is rated for voltage range of 24 - 380 Volts. It includes 24 - 120 Volts rated LED module for indicating device operation. It has a mechanical life of 10000 operating cycle for emergency stop. Switch easily accommodate one 20 AWG and two 16 AWG cable. It uses slow-make slow-break technique in contact operation for emergency stop. It uses 10 Amps current rated type SC fuse for providing short circuit protection. 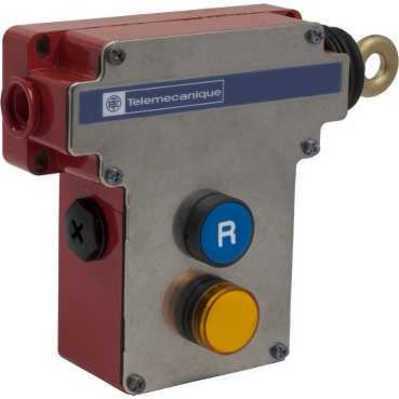 Switch is designed to use in conveyor systems, material handling, machine tools and electrical testing stations. It has terminal clamp tightening torque of 0.8 Nm for easier conductor connection. It operates within a temperature range of -27 to 70 deg C and stored within a temperature range of -40 to 70 deg C. It is IP65 rated for maximum degree of protection. Switch is UL listed and CSA certified.